The Physick Book Of Deliverance Dane by Katherine Howe is divided into two time periods: Salem and the witch hunts raging through Essex County, Massachusetts in 1692, and the same area in more or less modern times (1991). For me, the magic is in how the author captures the dichotomy of travelling to historic places. You may be looking at a house built in 1690, but aside from the architectural details, you’re still seeing the 21st century. What were once farmhouses are now surrounded by suburbs. Even Marblehead, Massachusetts, where most of the book is set, and boasts over 200 homes built prior to the Revolution, is marred by power lines, criss crossing the view like spider webs. It takes imagination to find the history bubbling beneath the surface and put it to paper. Katherine Howe does this with startling effect. In short, Marblehead is a time machine. 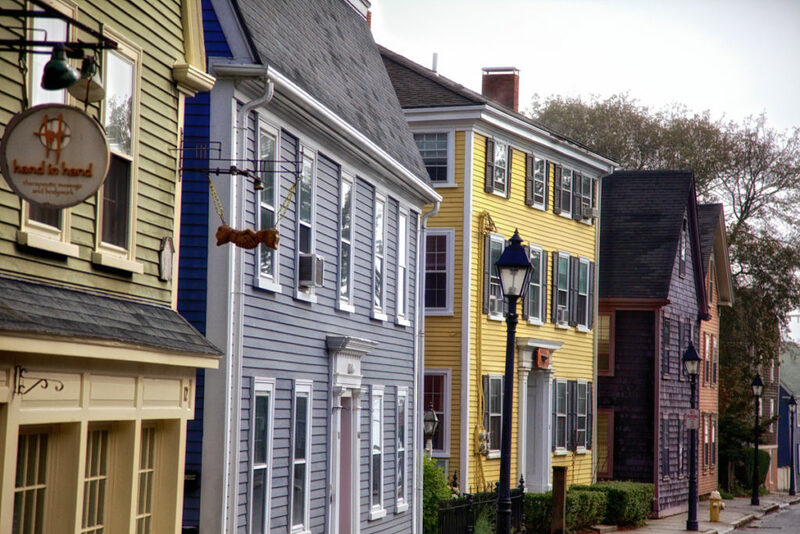 Not that the streets of Marblehead are a museum, they’re not. This isn’t Colonial Williamsburg, but a living, breathing village. It just so happens this village is eaten up with history. You can’t view the town from the ramparts of Fort Sewell and see Marblehead in Deliverance Dane’s day, but if you pay close attention, you can take slices of nearly every view in town and see back more than 200 years. Reading the novel was like a trip back to Marblehead. I’ve gotten hammered at Maddie’s Sail Loft, walked many of the same streets in the novel, been lost in the winding streets of Marblehead and spent time at many of the other Essex county sites she writes about, including Salem. So it occured to me, why not make up a mini-tour of Essex county based on locations from The Physick Book of Deliverance Dane? Or rather a visual tour of the locations in the book, so readers can get the setting in their head the way it deserves? First stop is old town in Marblehead. There’s nothing I can say about it that hasn’t already been written a thousand times elsewhere. Marblehead’s days as a fishing village are long over, and though you still see a fair bit of business devoted to the sea, it’s mainly tony shops, galleries and antique shops with a handful of good restaurants. Once you get into the residential sections of old town, its all winding streets heading up hills and down, unexpected ways of passage which climb through what feels like people’s yards up a steep hill into the business district, all dotted with seaman’s cottages and captain’s houses, often in a riotous jumble of colors, and the occasional mansion built by historic figures. 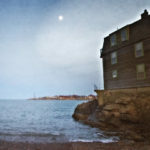 I read someplace that the reason houses in Marblehead are built at crazy angles, is so that every house can have a view of the sea. I reckon it’s also to take advantage of every foot of ground in a limited space. It seems everyone ends up on Front street and hoofing it out to the point at Fort Sewall, and it’s worth the walk. Great views of the harbor, beautiful colonial era homes with window boxes overflowing with flowers, and the harbor always right there. You even pass by Â Screeching Lady Beach at Lovis Cove, site of the ghostly wailing woman, killed by pirates in the 18th century. Unlike in the book, most of my time in Marblehead has been spent in late fall or winter, so I’ve never taken advantage of the opportunity to swim. Instead I’ve typically been fighting frost bite from the cold Atlantic winds. But from what I can tell, the swimming platform where the book’s heroine,Connie bumps into Sam – the love interest of the book, and the park where the two of them, along with her friend Liz watch the fireworks would be Crocker Park. Crocker Park is a great place to watch the harbor, any time of the year, and the stone bluffs give an excellent explanation of why the town is called Marblehead. And if you visit in the summer, the swimming platform is available for a dip. From Marblehead, The Physick Book of Deliverance Dane shifts to Salem. Connie goes to the FIrst Church in Salem for research, which in the book can be reached by taking 114 from Marblehead to Salem and then a left on Proctor Street. While you won’t find the First Church, Proctor street takes you up on Proctor’s Ledge, thought by many to be the actual site of the hangings in the Salem witch hunts of 1692. Tradition has it that the hangings took place further up on Gallows Hill, now looking down on you from the right. Gallows Hill can be visited, but Proctor’s Ledge is a bit trickier. If you drive slow and peek between the houses on your left, you’ll see a rocky ledge, now covered in trees. That would be it. For a better view, or at least more peaceful view, try the parking lot behind Walgreens at the base of Proctor Street. In fact, you won’t find a lot of old Salem in Salem town any more. The site of the original meetinghouse is now someplace in the middle of Essex Street. The ground once occupied by the original Salem jail which housed its doomed inmates, is now an ATT building. The field where Giles Corey was pressed to death is now the Howard Street Burying Ground at 29 Howard Street, appropriately enough, a particularly eerie place at night. 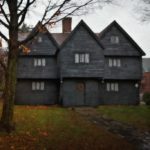 If you want to catch a glimpse of what Salem might have looked like in the 17th century, pass on the Witch House, home to Jonathan Corwin, a judge in the witchcraft trials, though it’s believed that some of the examinations of the accused took place here. Beautiful house, but the setting is entirely too congested. 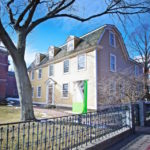 Instead have a look at the John Ward House, c. 1684 at 132 Essex Street, which is even open for guided tours. Or better yet, try the Samuel Pickman house, c. 1681 at the corner of Charter and Liberty Streets, one of Salem’s oldest houses, and with the Salem Witch Trials Memorial and Old Burial Ground essentially in its back yard. 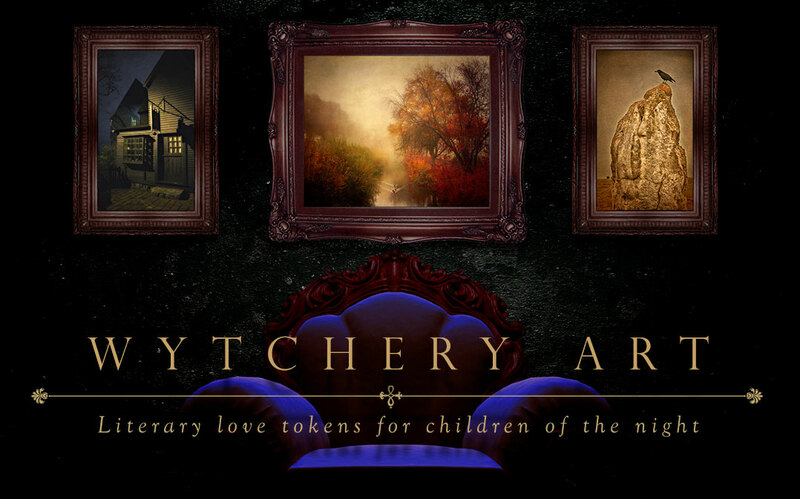 With a desire to ramble and a bit of energy, you can cover all these locations on foot, and in the process pass through the heart of Salem as witch city, which is covered in the book as well. Do it in October and find yourself in the midst of a carnival atmosphere even. Howe does mention another Salem landmark, the Athenaeum, c. 1907, located at 337 Essex Street, and open to the public. 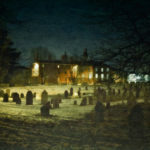 Nathaniel Hawthorne related seeing the ghost of a friend of his, the Reverend Harris here. Head north into Danvers, once known as Salem Village, and you’ll likely to find yourself on Holten street. When you reach the end, where it empties into Collins, you’ll see a house on your right associated with the Salem Witch Hunts. This is the Holten House, once home of Benjamin and Sarah Holten. 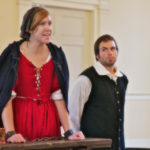 Sarah testified in the witch trials that Rebecca Nurse, infuriated over an errant pig of the Holten’s that had wandered into her garden, upbraided and bewitched Benjamin. Rebecca was hung, and her homestead is nearby at 149 Pine Street. I’ve yet to catch any humans there to take a tour, but then again I’ve never found the gates locked either. This is one of the few spots where you can really get a feel for what Salem Village was like at the time. In addition to the Rebecca Nurse house and barn, there’s also a reconstruction of the Salem Village Meetinghouse built for a made-for-tv movie of some renown, Three Sovereigns for Sarah. Hang a right off Holten onto Collins, which turns into Centre street and you’ll find the First Church of Danvers Congregation church. Make a right and whip into the parking lot. This is the same parish church that was once home to the Reverand Samuel Parris, his daughter Elizabeth and slave TItuba. Along with Abigail Williams and others, this was the parish church which set off the firestorm. Well, sort of. The new church doesn’t sit on the same spot as the old Meetinghouse. Walk out of the parking lot and make a right for a block or so. You’ll come upon the Salem Village Witchcraft Victim’s Memorial, which is of course modern. Across the street is the Darling Prince house, c. 1681. This house used to sit elsewhere, and it sits now on the footprint of the original Meeting House, where the first examinations were held in the Salem witch hunts. Come back to the place from which you came, and as you reach Centre street, on the right is Ingersoll’s ordinary, c. 1670. Ingersoll’s was originally going to be the place where the accused were interrogated, but the crowds spilled over and the proceedings were moved to the meetinghouse. The examiners ate, drank and lodged at Ingersoll’s, and it’s a safe bet that much of what was happening in Salem Village at the time was argued and debated here. In fact, since it was public opinion which in large part decided the victim’s fate, it’s a safe bet that Ingersoll’s had more of a part in the debacle than has been noted. Don’t get back in your car yet, but take a right on the corner past Ingersolls, and wander down the street a bit. Centre street can be insanely busy at times and not exactly lined with pristine architectural examples, nonetheless you’ll find a small alley on the right between two houses. Though it looks like a private drive, take it all the same. Paved with ancient rocks, and often slushy after a rain, soldier on and you’ll come across the foundation of the original Salem Village parsonage. This is where Tituba sent the girls into a tailspin which eventually led to the deaths of twenty innocent victims. Situated basically in people’s backyards, it’s surprisingly secluded and quiet, and I never fail to find myself moved being here. None of the Danvers locations figure prominently into Howe’s book. But you have to go through the area anyway as you head north to Newbury, and one of the most fascinating elements of the story. 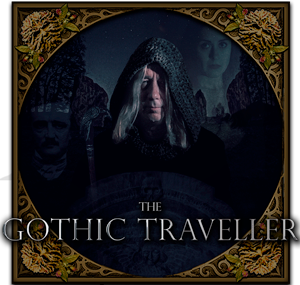 In the book, Sam takes Connie on a nocturnal tour of Marblehead which culminates in him showing her the Witch Stone, a stone covered with mysterious carvings, part of a stone wall. In reality it’s in Byfield, along a country lane, though as in the book, built into a stone wall. The Witch Stone dates back to 1723, and true enough, it’s creepy and mysterious, looking more prehistoric than historic. 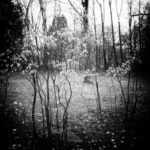 In The Physick Book Of Deliverance Dane, the story involves the possibility that one of the victims of the Salem witch hunts was in fact, a witch. And it was this stone which persuades Connie to consider this premise. In reality it was a walkway stone leading to the mansion of Richard Drummer Jr, commissioned by his son John, and carved by Robert Mullicken of Bradford, known for his gravestone carvings. I’d give you the address but you know, the most amazing thing about the stone is that out here, on a public road for most of the past century, it’s stood unmolested. I’d like to think that has less to do with people knowing it is here, and more to do with the pride that people take in their past. But I’m not taking any chances, and if you want to find it bad enough, you will without my help. There’s probably not a better place to ponder the places you’ve been than over a beer and a shot at Maddie’s Sail Loft, according to Connie’s mother, Grace, “one of the ten best sailing bars in the world.” Indeed, sailors used to tie up at the end of State Street and come ashore and up the street to Maddie’s for libations. Howe perhaps overstates the degree to which Maddie’s is a dive, though I know it’s gone through some changes over the past few years, so maybe they cleaned up the joint. One of the changes is that it now boasts a loud and boisterous college crowd. Which is appropriate enough I suppose, as after all, Connie and Liz are both college students, albeit a bit past the party till you puke attitude which you find in Maddie’s of late. The Physick Book of Deliverance Dane is after all, a work of fiction. And like any good book, it’s the author’s right to create her world the way she would see it, rather than documenting a particular place with journalistic precision. The book is Marblehead and Salem the way she sees it, which is in some ways more accurate than a verbatim description. She draws in broad strokes and lets your imagination fill in the details. It’s just an added bonus that when you find yourself in the settings of the novel, the landscape does not disappoint. Nicely done! As a native of the North Shore, you pointed out things I hadn’t noticed before, and I loved Katherine Howe’s book. Will have to go exploring…. As one of the many decendants of Rebecca Nurse, I’m thrilled to see this tour put together. The author Ms. Howe, is also a decendant. Talk about bringing history to life.